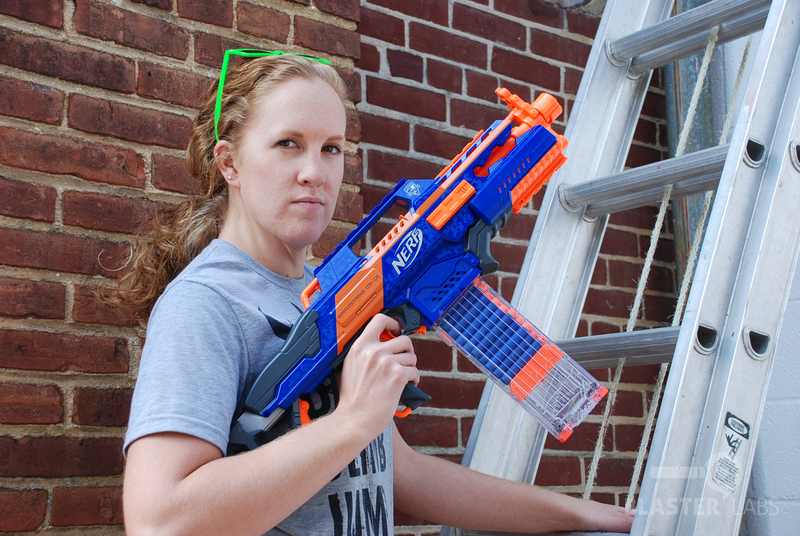 All things considered, the Nerf N-Strike Elite Rapidstrike CS-18 is largely considered to be one of the best engineered–and most readily modifiable–Nerf Elite products to-date. Brought to market in September of 2013, it was widely seen as the successor to the Stampede ECS, but with several key upgrades. The Rapidstrike CS-18 was found to shoot faster, farther, and generally more consistently than its predecessor, and had a gearbox that was more reliable, less complicated, and had fewer mechanical parts. 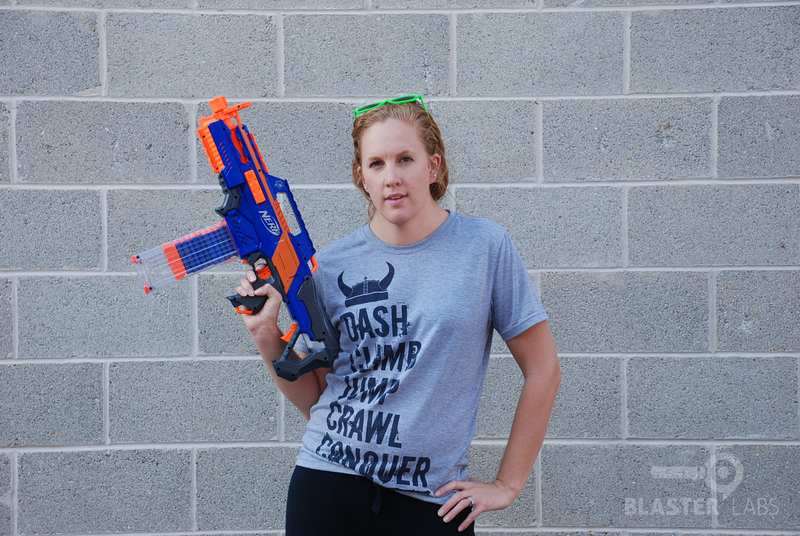 The Rapidstrike was also lighter in weight, easy to modify, and it felt great to use. Fast-forward to 2014, when Hasbro introduced the world to the Nerf Cam ECS-12, a blaster that looked curiously like the Rapidstrike, but featured a built-in camera and a claimed range of up to 85 feet. 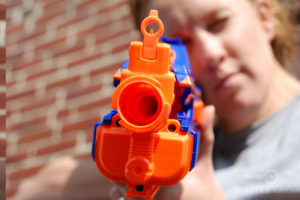 At an $80 price point, speculation began that the Nerf Cam ECS-12 was being softly positioned as the new “flagship” blaster of the Elite line. 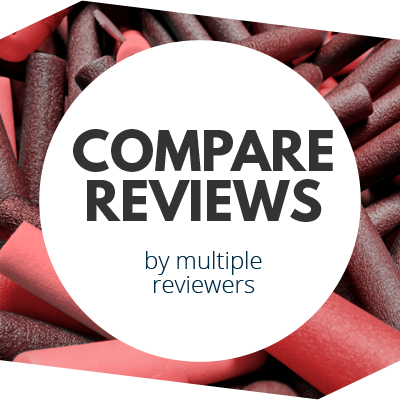 So, as we outlined in Part 1 of this head-to-head review, we decided to put the Nerf Came ECS-12 up against the standard-bearing Rapidstrike CS-18 and find out for ourselves. 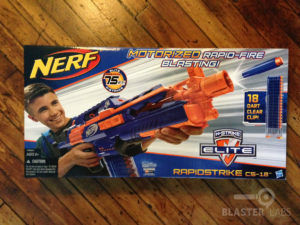 The Nerf N-Strike Elite Rapidstrike CS-18 has been on shelves for about a year now, and officially still retails for around $40, though it can often be found for $30 or less. Rumors of a new, white-striped, Rapidstrike with “XD” ranges have surfaced online, though this model has yet to appear on store shelves. So, for now, we’re going to look solely at the existing Elite version. 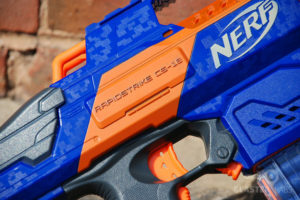 We should also point out the Rapidstrike has been one of the more popular models for modders to put under the knife in recent memory, with common alterations including rubber breech curtain removal, new motors, higher voltage battery packs (15A+, please), switch upgrades, burst firing, shot counters, etc. All of which goes to show how popular this model has become, and how well it has been received by the community at-large. It also demonstrates that the fundamental engineering put into this model provided a solid foundation from which improvements could be made. 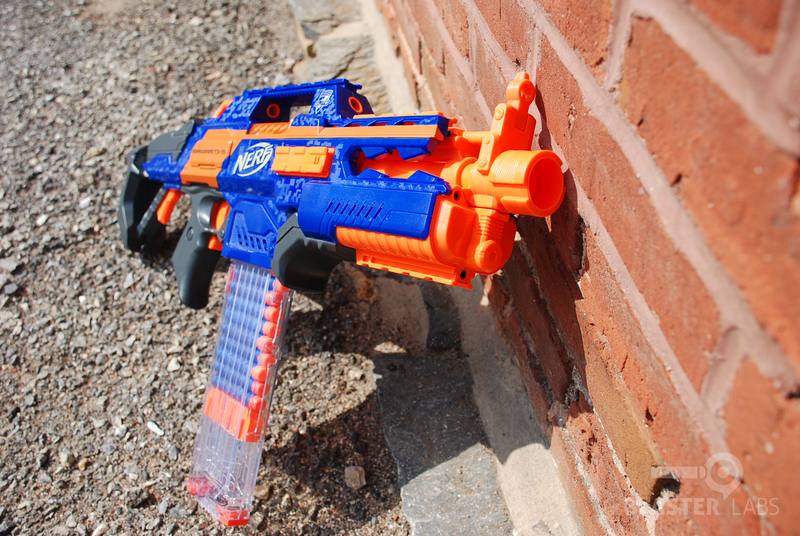 But since we’re seeking to compare the stock Nerf Cam ECS-12 to the stock version of the Rapidstrike CS-18, we won’t be taking any of this modification potential into consideration. Suffice it to say, if you want to mod your Rapidstrike, you won’t have a hard time finding out how, and the results can truly be impressive. Looking specifically at the stock Rapidstrike CS-18, we note that it comes in the typical, fully-enclosed package, with the just-as-typical, overly quoifed white boy holding the blaster (what is is with lack of diversity in these box designs, Hasbro?). The package displays a claimed range of 75 feet, and a clear, 18 dart clip is found inside (unless you get the “Rapid Reload Kit” version, which is exclusive to Wal-Mart, and packs a spare, 18 dart clip). What’s not in the box are the four “C” batteries that are held in a tray under the barrel and that are required for operation. The design of the Rapidstrike CS-18 is certainly on the more “tacticool” end of things, which suits us just fine. It includes no less than five tac rails, three primary strap points, an adjustable (but non-removable) stock, the aforementioned 18 dart transparent clip, a rifled barrel, a trick sight that doubles as the top handle, and a battery tray below the barrel that likewise doubles as the front half of the fore-grip. 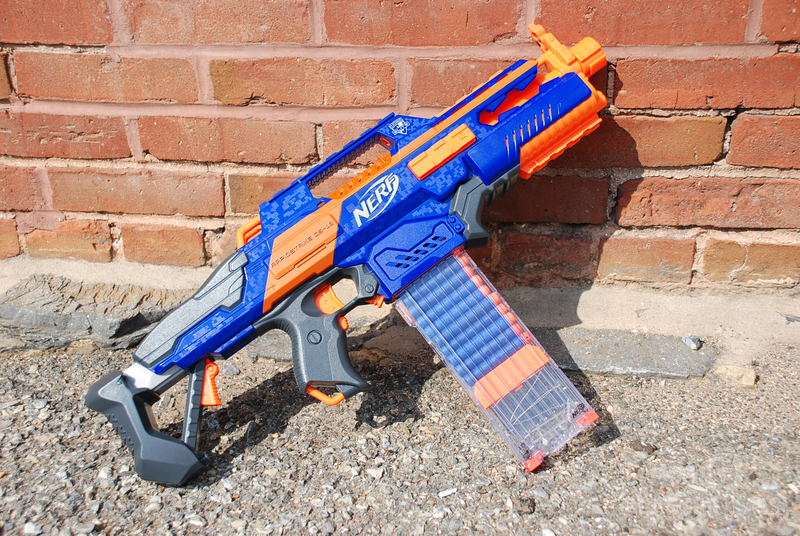 The current, non-XD version of the Rapidstrike sports the usual blue/orange color palette, which is broken up by some dark gray elements, some silvery bits on the shoulder stock, and the clear plastic of the dart clip. The only aesthetic shortcoming we noticed was the somewhat thinly-applied orange stripe down the side, which caused the raised lettering of “Rapidstrike CS-18” to look prematurely worn. All things considered, it’s an imposing, but smartly designed blaster that looks great and appears to be nicely put together. 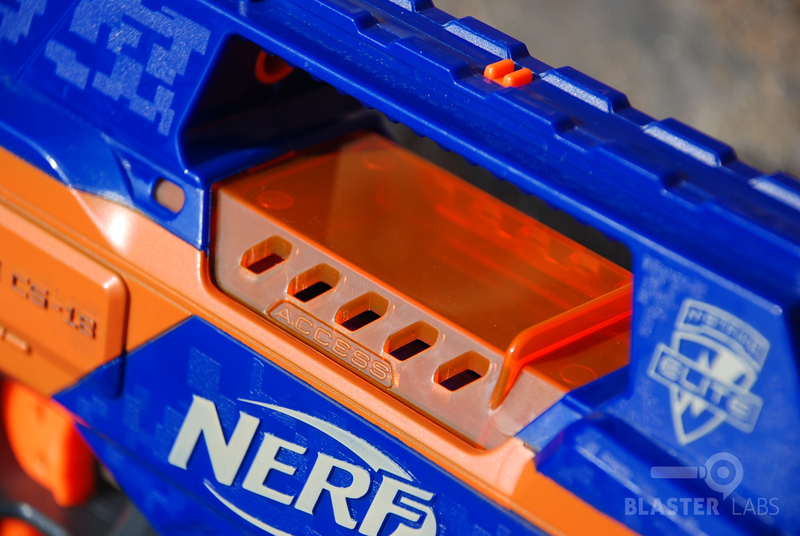 The Nerf Cam ECS-12 has a more cleanly-applied paint job and a more visually varied color palette, but to our eyes, the gaudy “ELITE” emblazoned on the side, and the “where’d this come from?” white-bodied color scheme will make the Nerf Cam ECS-12 feel more dated than the Rapidstrike much more quickly. The Rapidstrike CS-18 makes a strong first impression in regard to ergonomics, as well. 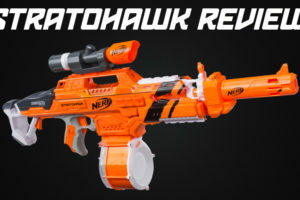 In fact, we would judge it to be among the best form-factors for a Nerf product to-date (which may well be why Hasbro did a virtual copy of it for the Nerf Cam ECS-12). Overall, and despite the heft of the “C” batteries mounted toward the front, we found the Rapidstrike to be very comfortable to hold and use. 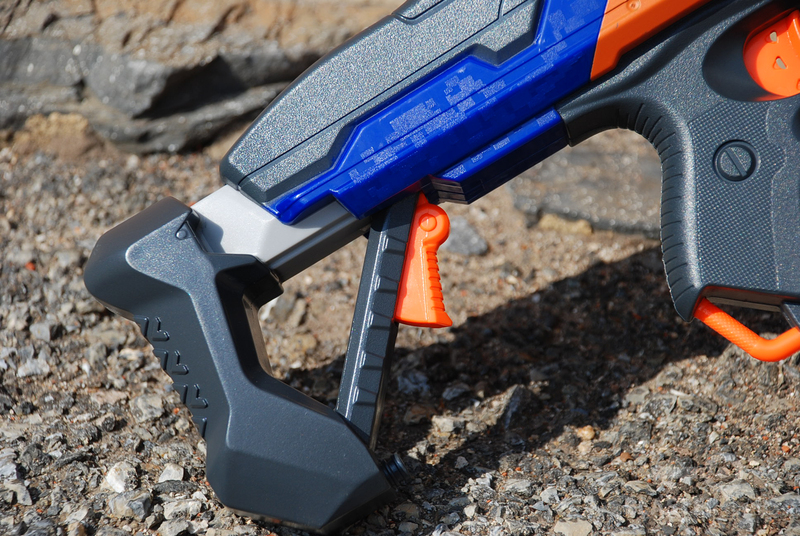 Since your secondary hand is holding the fore-grip near the batteries (which allows this supporting hand to do more of the work versus the trigger hand, unlike the Stampede), the weight becomes a minor issue, and actually gives the Rapidstrike a reassuring heft. Speaking of which, we commend Hasbro on continuing to use solid, good quality plastics that are sized appropriately for adult use (both in girth and in distance between grips and shoulder stock), which is quite unlike some competitor products we’ve tried recently. Using the Rapidstrike CS-18 is straightforward. As expected, one simply pulls the Acceleration Trigger (below the trigger guard) to get the internal motors spinning, and then pull the firing trigger to launch darts in full-auto fashion. But it’s also worth noting the Rapidstrike can fire single shots or in short bursts. And as fun as full-auto may be, we actually recommend firing in bursts, since constant firing tends to slow the flywheels, reducing the speed in which darts can be fired. 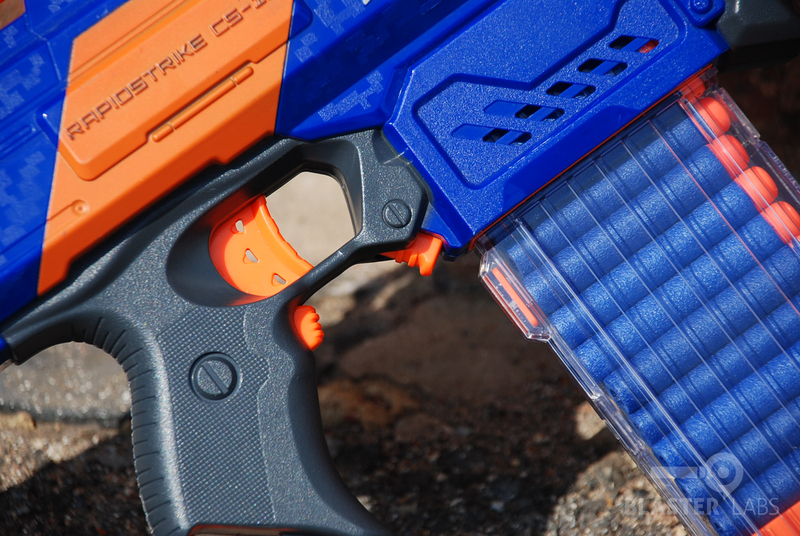 The Rapidstrike uses more current-hungry motors than many flywheel-based blasters, hence the larger “C” cell battery requirement versus the usual “AA” batteries found in most, semi-auto flywheel models like the Nerf Cam ECS-12. But even so, a light touch with the trigger tends to yield the best results. Speaking of results, the numbers tell the story. In full-auto mode, we found the Rapidstrike CS-18 to reach a maximum distance of 49.5 feet PTG (parallel-to-ground), and up to 59 feet with a roughly 30-degree arc. However, when we let the flywheels hit max speed and only fired a single dart at a time, we hit a very impressive maximum distance of just over 70 feet. This is a few feet short of what the box claims, but is nonetheless the exact same distance that our “XD” rated 2-In-1 Demolisher recently hit, and is a good 3 feet more than we could reach with the Nerf Cam ECS-12. Of course, this is a “best case” score, and most users won’t follow the single shot method that we used to hit this ultimate range. 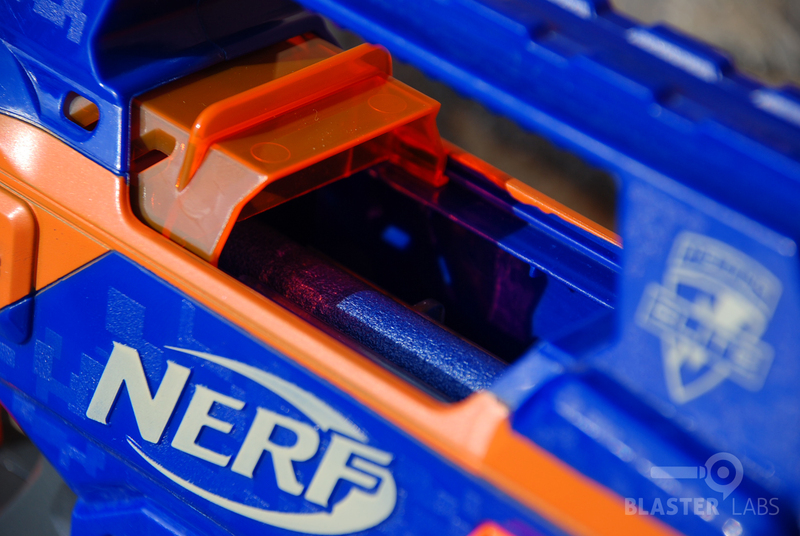 But even so, the facts speak for themselves: the bone-stock, non-XD Rapidstrike CS-18 can best the max range of the brand-new Nerf Cam ECS-12 by at least a yard. 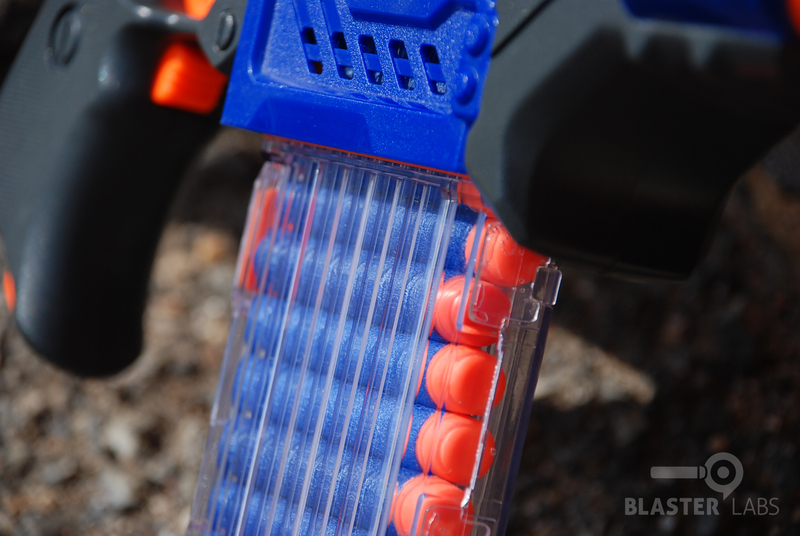 As we hinted in our review of the Nerf Cam ECS-12, there’s likely one very good reason the Rapidstrike can reach the ranges it does: dart velocity. When measured on our chronograph, the Rapidstrike flung darts at a low of 66 feet-per-second, a high of 73 feet-per-second, and an average of 69 feet-per-second. 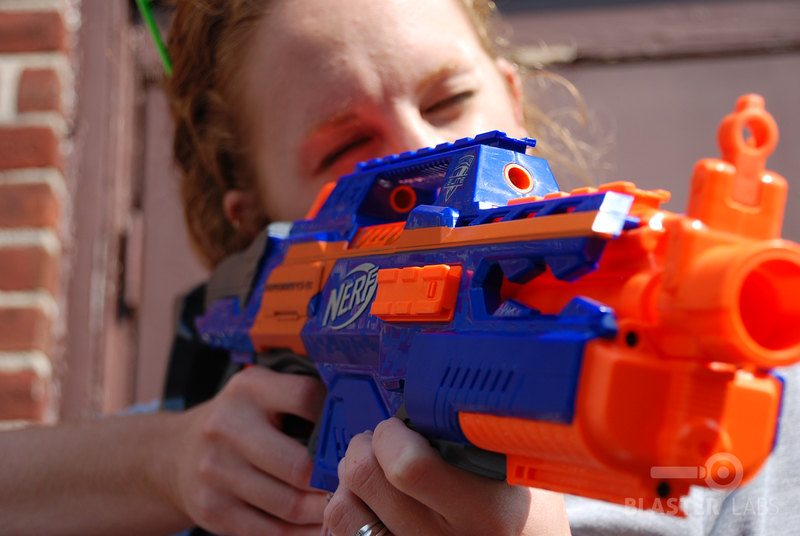 That’s about 2 feet-per-second faster than the Nerf Cam ECS-12 could manage, at 64, 71, and 68, respectively. Does 2 feet-per-second equal a yard of extra distance? That would be our guess. Credit the different motors and batteries, but it’s clear the Rapidstrike wins in dart velocity, too. Our final performance metric is rate-of-fire, which should also be an area where the Rapidstrike CS-18 comes out on top. Ironically, it doesn’t. 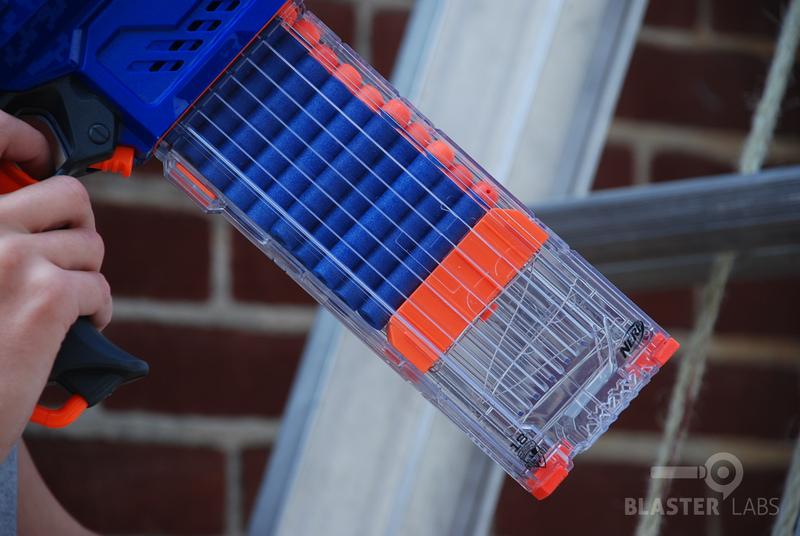 As we mentioned in the Nerf Cam ECS-12 review, this new, semi-auto XD camera-touting model belts out an astonishingly quick 25 darts in 5.48 seconds, for an average of 4.5 darts per second. In full-auto mode, the Rapidstrike CS-18 isn’t quite as, uh, rapid. We were able to plow through a 25 dart drum in a minimum of 6.8 seconds. This is still reasonably fast for a stock blaster, but at 3.7 darts per second, it’s not nearly as quick as the Nerf Cam ECS-12. And for the curious, firing in semi-auto didn’t make the Rapidstrike any faster. Despite our best efforts, the Nerf Cam ECS-12 is simply more rapid than the Rapidstrike. Go figure. 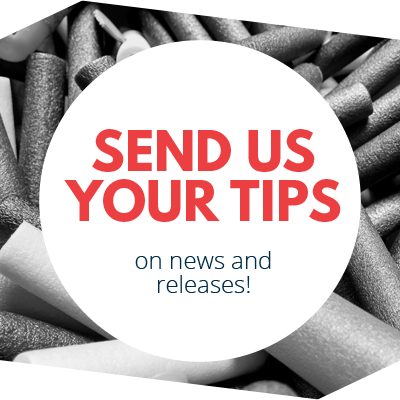 We’ll wrap-up our performance findings by simply noting that the Rapidstrike CS-18 has been known to have some jamming issues due to dart quality and the infamous rubber dart skirt. We’ll also note that some well-documented modifications, and/or using more powerful batteries reportedly fixes both. We’ll also note that we didn’t experience said jamming issues in our testing, or in any recent game play, so we’ll not dock the Rapidstrike’s score significantly in this regard, but it is nonetheless being taken into consideration based on community experience. First, we want to applaud Hasbro and the Nerf design team specifically for continuously looking at new ways to innovate and add different play mechanics to a category that is now more than two decades old. We understand how risky it is to bring a new product to market, specifically one that could easily be deemed as too expensive for the category. 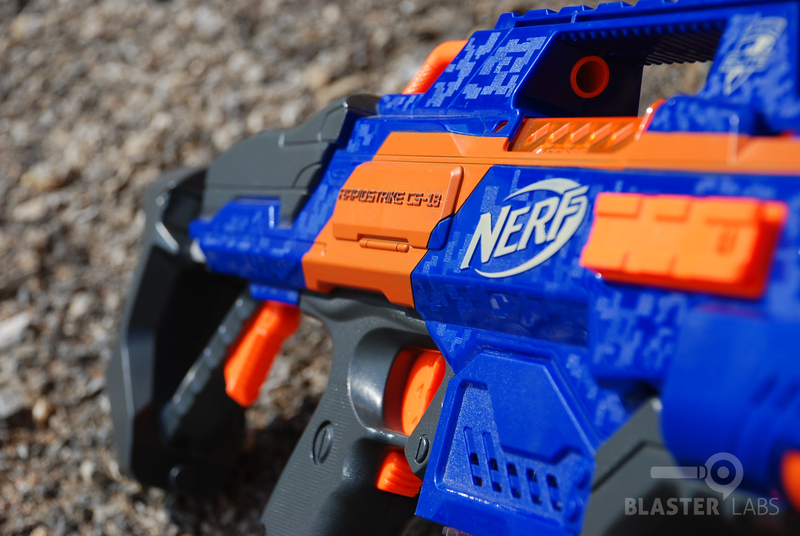 The Nerf Cam ECS-12 will unfortunately fit that description for most, particularly in comparison to products like the Rapidstrike CS-18 that show just how much is possible in a blaster for half the price or less. But if nothing else, the Nerf Cam ECS-12 does do one thing: it reinforces that Nerf is the premium brand in this space, and that they’re not afraid to challenge convention. But in the end, the verdict is clear: whether in stock form–or especially in the hands of a good modder–the Rapidstrike CS-18 is still Nerf’s flagship blaster (at least until the XD version arrives). And with performance that equals or betters the Nerf Cam CS-12 at half the price or less, it remains a good value. No, the Rapidstrike doesn’t have a camera. But it has tactical rails that permit the addition of a phone mount, or–we can hope–perhaps a future camera scope-type add-on. But either way, most players won’t miss the camera because they’ll be too busy having fun with everything else the Rapidstrike does so well for so little. 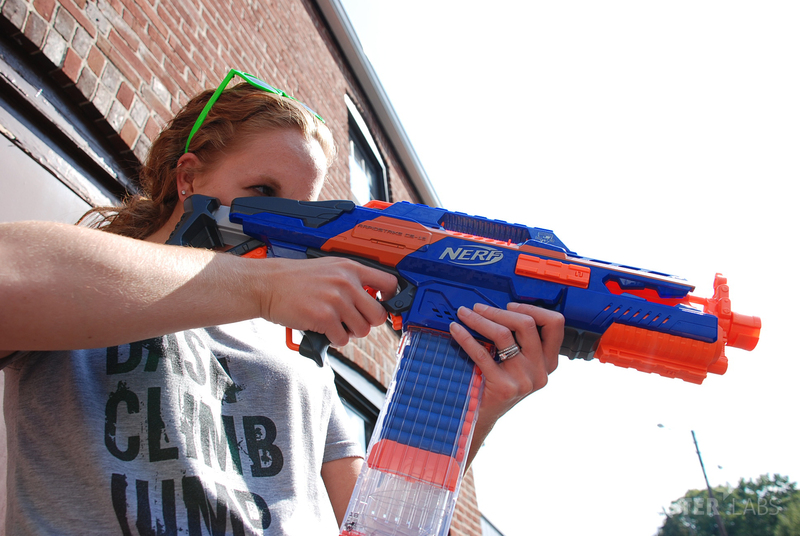 And for that reason more than any other, the Nerf N-Strike Elite Rapidstrike CS-18 is still the king of the hill. This entry was posted in Dart Blasters, Reviews and tagged elite, n-strike, nerf, Rapidstrike CS-18 on September 28, 2014 by PMindemann. Was the Rapidstrike new out of the box? If you have used it at all, then comparison of velocities with a NIB cam or Demolisher will be meaningless. The reason for this is foam build up on the flywheels. This build up can give 5-10fps more velocity, as it effectively narrows the flywheel gap and increases friction between the dart and the wheels. Originally tested by Toruk, results on his blog. Other than that, good comparison. I have been pretty underwhelmed by the XD flywheels to date, they show no sign of pushing the Rapidstrike off it’s top spot as king of Super Stock! Yes, it was a new blaster blaster purchased specifically for this review. We don’t test heavily used or “run-in” gear (unless it’s for durability testing), nor do we rely on anyone wakes tests for our data. Thanks for asking. Thanks, FoamData. Yes, it was purchased brand new, for this review. We don’t test items with significant wear, unless it’s for questions of durability. Should i get the rapidstrike or demolisher? Rapidstrike all the way!!! Especially if u know how to modify your blasters. 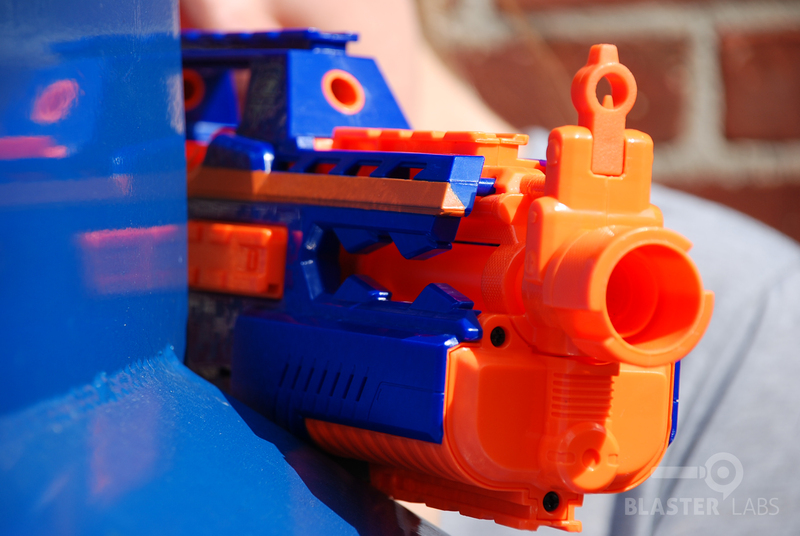 The Stryfe is a great alternative to the demolisher, because they are both flywheel blasters that are “semi-automatic”.